Uschi's path has been infused with ecclectic spiritual traditions since birth. From early years travelling Europe with her parents, and eventual migration west, she was educated within the teachings of philosopher J.Krishnamurti, at his Oak Grove school in Ojai, California. After completing her schooling Uschi was recruited to a job in the fashion world, working for a reputable high fashion company and assisting stylists on celebrity events. After 7 years in a very high paced lifestyle, she felt the need for change, and a pull to return to her roots in spirituality and mysticism. She just wasn’t sure where to begin whatever would come next. Returning to Ojai in 2001, she met her dear friend Kira Ryder, who had just opened Lulu Bandha's Yoga studio. Joining Kira in the budding community she was creating, and helping her organize events and workshops, Uschi found a fertile soil to blossom in, and a community of friends who encouraged her to believe in her dreams. A lifelong wish to journey to India finally happened in the Winter of 2007, when she went on a trip hosting students from the Krishnamurti schools in Rishi Valley, Bangalore, and Varanasi. She was so incredibly inspired, and it was clear she had found a home, and a new intention in her life. Returning to India in the Summer of 2008, she began to work with women in Varanasis outlying villages, contributing to a budding women’s empowerment project and developing a production center and headquarters for a fair-trade clothing line. The unit Uschi now leads trains women in crafts by recognizing their inherent talents as they develop new skills, giving them income generating work and cultivating monetary and emotional support for them within their families. 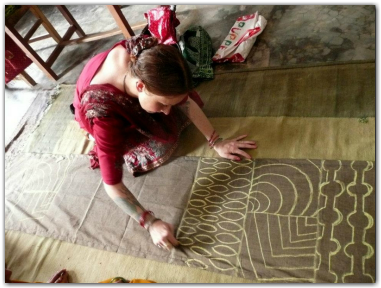 Currently based in India 9 months of the year, Uschi’s work has grown considerably over the last years and the community of women has blossomed into neighboring villages. She returns to the US every Spring and Fall to be with friends, and help host the International Ojai Yoga Crib.